I have noticed a suburban trend whereby homeowners with attached, enclosed garages have forgotten that it is possible to actually park their cars in them. All over America, perfectly functional vehicle storage areas have been repurposed to protect structurally-compromised couches and optimistically-procured exercise equipment. Meanwhile, the homeowner’s second largest investment sits outside collecting hail-damage and bird feces. 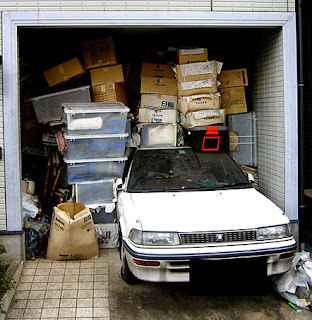 We have a neighbor whose late-model vehicle has never experienced the luxury of weathering a storm indoors because their garage is full of items whose aggregate value probably would not even cover the cost of a few tanks of gas. They are literally telling the world that keeping a perpetually-immobile lawn tractor and a couple of defective birdcages dry is more important than protecting their only mode of transportation from preventable harm. I realize that I am probably steeping on a few toes and there are many people I love and admire who will read this while resting in the yard-sale papasan chair that displaced their Lexus, but this epidemic must be stopped before it is too late. I have heard all of the arguments in favor of garage outsourcing. The house doesn’t have enough storage space. We are just waiting until we can afford a storage unit. It would be easier for someone to steal my old tape deck than my Nissan. In my opinion, there a very few legitimate reasons to place a $20,000 sedan outside so that you can protect future estate-sale fodder from the adverse effects of inclement weather. Gam-gam’s iron lung requires an emergency generator whose switch housing must be placed away from precipitation. You discovered a lost Rembrandt in your uncle’s attic and need a place to store it until Sotheby’s can arrange for a pickup. You have taken possession of an adolescent Bengal tiger and wish to hide its existence from your neighbors but don’t trust it enough to leave it in the living room with your beloved Pekingese “Reginald Cuddleford” while you are at work. You drive a Pontic Grand Am.